Borussia Dortmund's UEFA Champions League quarter-final with AS Monaco promises to be a goal-busting affair with the two teams among Europe's most attacking sides. Want a BVB-twist to your Official Fantasy Bundesliga team? Sign them up here! bundesliga.com looks at five sub-plots to one of the most exciting ties of the round. In teenagers Christian Pulisic and Ousmane Dembele, BVB boast two of the most highly-prized youthful talents, the latest to come to the fore internationally with Die Schwarzgelben. Monaco, despite being bankrolled by a Russian billionaire, are also putting their faith as well as money into youth with Bernardo Silva (22), Thomas Lemar (21) and Kylian Mbappe (18) rising to the fore. The battle between the quality youngsters — many of whom are already full internationals — should provide fireworks. This may be tempting fate, but surely this tie will be one absolutely jam-packed with goals. Only Barcelona (26) can boast a better scoring record in the Champions League this season than Thomas Tuchel's men (25) while Monaco have hit 88 goals in just 31 league matches to climb to the summit of the French top flight. With goalgetters proven on the European stage, such as Radamel Falcao and Aubameyang, on show, you shouldn't take your eyes off this one for a second. "The Monaco players told me they're looking forward to seeing the Yellow Wall," Dembele told L'Equipe on Monday. But are they really? Inspiring as it might be for the home side and impressive to impartial observers, it must be incredibly daunting for opposing teams. It must be all the more so for Monaco who average just over 10,000 for normal home games in Ligue 1, eight times fewer than Dortmund's. True, UEFA rules mean the Signal Iduna Park capacity will be reduced to around 66,000 for Tuesday's match, but even so…will Monaco's players be defiant or deflated at the sight of it? 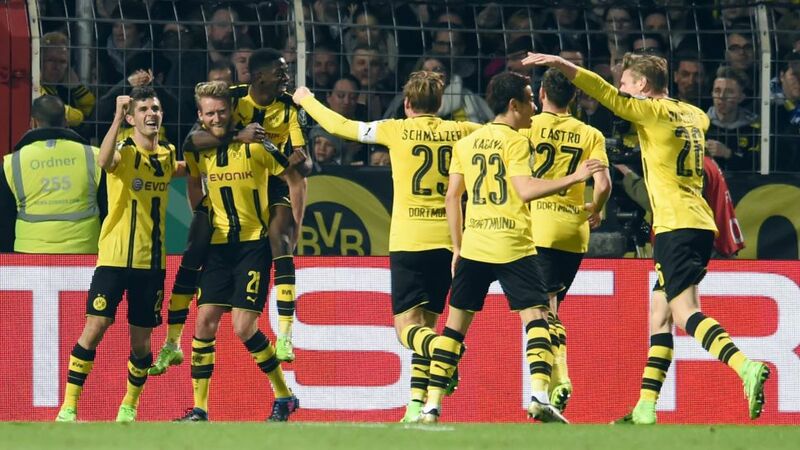 Click here for all the Dortmund news!